I grew up in Louisville, so I've been eating Benedictine all my life. I was surprised to learn it wasn't universally known, but it was invented by Jenny Carter Benedict, a caterer and restaurateur in Louisville and is pretty much regional. Like Hot Browns, which is WAY NOT vegetarian. ANYWAY, summer is the best time for Benedictine, because you can get fresh cucumbers. Put the cucumber in a strainer or sieve over a bowl and sprinkle to taste with salt. Let sit for a bit so some of the juice runs out. Miss Jenny only used the juice, but I and thousands like me use the cucumber, only adding the juice if necessary. 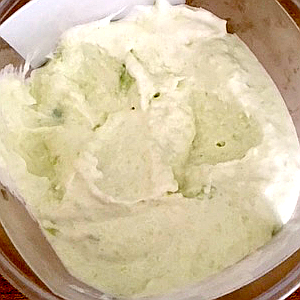 Put the cucumber, cream cheese, and onion to taste into a food processor and blend well. You can crush the cucumber with a fork, if you prefer, and mix everything with a fork. The result should be a very pale green. You can add a drop or two of food coloring, if you want to. I don't. This is very refreshing, and great on toast, bagels, crackers, or croissants. I'm posting at my blog today on the subject of a wonderful summer spread.